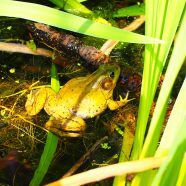 Get ready to test your lily pad leaping, frog-hopping, and insect-catching abilities during a frog slog adventure. This program is designed to inspire locomotion, mindful movement, and learning through play, while shedding light on the mysteries and needs of local amphibians. PreK Pathfinders is designed for children aged 3-5 and their grown-ups. Together teams experience nature through outdoor exploration, STEM, art, and stories. Programs are free, but advanced registration is required. This program is underwritten by Northampton County Parks.